Pain is a common experience throughout childhood and adolescence. It is well known that parent’s behaviour has a strong influence on children’s response to pain, however, little is known about how siblings (i.e., brothers and sisters) might affect the pain experience. Sibling relationships are common and have an important influence on children’s development. In this study we examined how siblings interacted with one another during a painful experience, and whether a sibling’s behaviour influenced how children feel when they’re in pain. We also looked at how children’s sibling relationship quality influenced how they responded to pain. A total of 92 pairs of siblings participated in this study. We found that children who had more positive and warm sibling relationships tended to do more behaviours that took their attention away from their pain, like distracting themselves, while they were in pain with their sibling present. 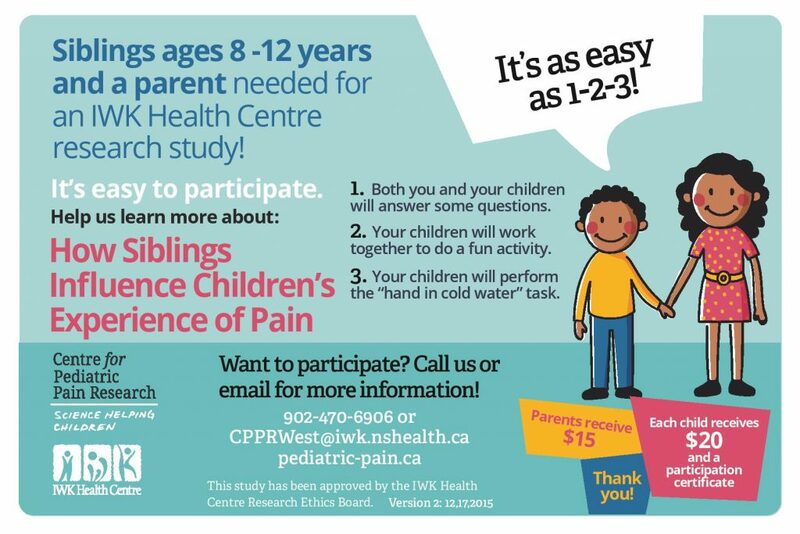 We also found that children had lower pain tolerances when their siblings did behaviours that brought attention to their pain, like reassuring them or asking how much it hurt. This study showed that siblings indeed play a role in how children experience pain. Schinkel, M.G., Chambers, C.T., Corkum, P., & Jacques, S. (2018). A dyadic analysis of siblings’ relationship quality, behavioural responses, and pain experiences during experimental pain. Pain, 159(8), 1569-1579. Please note that we are no longer looking for new families to participate in this study. "Siblings can play a big role in how a child deals with pain" Meghan Schinkel was interviewed by The Chronicle Herald on her research. Click here to read more about Meghan's work. CBC News interviewed PhD Student, Meghan Schinkel, and her supervisor, Dr. Christine Chambers, about their new research on how siblings impact the pain experience. Click here to read more.